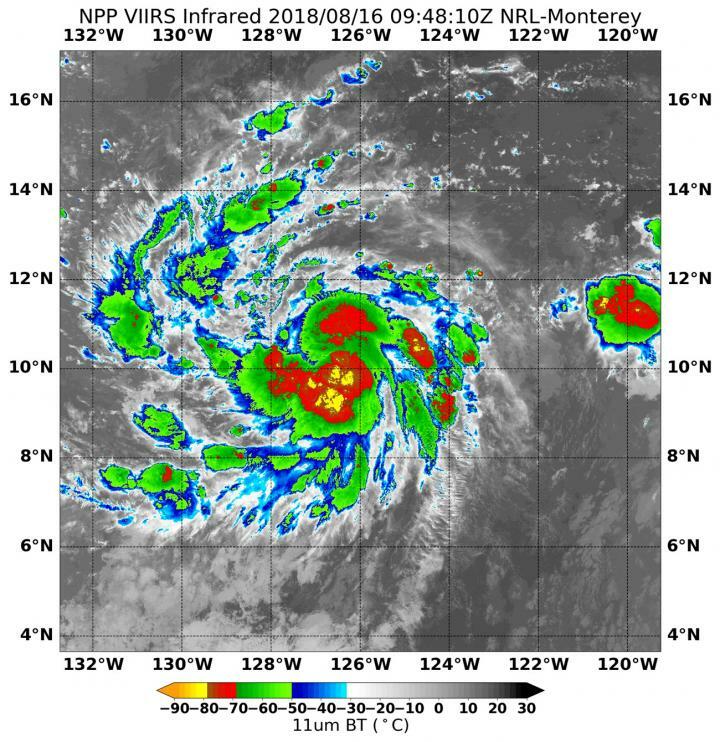 Tropical Storm Lane continues to strengthen and NASA's Aqua satellite provided infrared imagery that showed storms have intensified around its center. On Aug. 16 at 5:48 a.m. EDT (0948 UTC) the Visible Infrared Imaging Radiometer Suite (VIIRS) instrument aboard NASA-NOAA's Suomi NPP satellite analyzed Tropical Storm Lane's cloud top temperatures in infrared light. VIIRS found cloud top temperatures of strongest thunderstorms were as cold as or colder than minus 80 degrees Fahrenheit (minus 62.2 Celsius) around the center. Cloud top temperatures that cold indicate strong storms that have the capability to create heavy rain. At 11 a.m. EDT (1500 UTC), the center of Tropical Storm Lane was located near 10.6 degrees north latitude and 127.6 degrees west longitude. About 1,445 miles (2,325 km) west-southwest of the southern tip of Baja California, Mexico, and about 1,935 miles (3,115 km) east-southeast of Hilo, Hawaii. Lane is moving toward the west near 14 mph (22 kph) and this general motion is expected for the next day or so, followed by a turn toward the west-northwest. Maximum sustained winds have increased to near 60 mph (95 kph) with higher gusts. Lane is forecast to become a hurricane by tomorrow and could become a major hurricane over the weekend.